Alabama fans please shut your eyes, or don’t, because you guys are smart enough to figure out that much of the rest of the college football loving universe despises your head coach. With success there will always be hate and jealousy and the diminutive head coach of the Crimson Tide is simply the best coach in all the land, and one could make an argument that he’s one of the best, if not the very best in the history of college football. There are numerous reasons why America sees Saban as quite possibly The Devil reincarnated. First of all look at his hair. This man will turn 63 years young on Halloween, the night that we celebrate the undead. Coincidence? I don’t believe in coincidences. Nick Saban has the hair of a 25-year old and doesn’t appear to age. I’m not saying he’s the devil, but how many people, women in particular, would give their soul up to look 20 or more years younger? Aside from Saban’s being the best looking head coach this side of Kliff Kingsbury, he appears to be miserable all the time- even when winning. Everyone knows someone like this. It could be the girl that you used to date (mainly because she’s hot but you knew she was crazy, let’s call her Sarah) that had a problem every single day and the world was out to get her? Maybe it’s a co-worker who has a problem with everything and smiles about three times a year, usually when someone slips and falls? It could be your grandparents who when you ask them how they are, begin with a diatribe about their medical chart that only a med student from Johns Hopkins would understand. In fact, Saban’s curmudgeon-like demeanor is the only signal that he is just a few years away from collecting Medicare. Even when winning a national championship, Nick Saban still seems like his son-in-law asked him for a loan. Thus far, the reasons we hate Nick Saban are pretty simple. He wins consistently, he has great looks and hair, and he always seems miserable. Now why else would we hate Mr. Saban? Loyalty, or his lack thereof. Saban won his first national title at LSU and seemed poised to build an SEC powerhouse (similar to what he’s currently doing at Alabama). Instead of making himself into a Bayou legend that would surmount the likes of Drew Brees and Louis Armstrong, Saban took his talents to South Beach (actually Davie) to coach the Miami Dolphins. When the going got tough in Miami, Saban got going….out of town and back to college with his tail between his legs. With all the tact of a young Bobby Petrino, Saban bolted the Miami franchise for the job at Alabama after using no “coachspeak” and addressing directly the rumors of him leaving by saying, “I’m not going to be the Alabama coach” (spoiler alert: he became the Alabama coach). Clearly this was the right move for Saban as the Dolphins organization has been the very definition of dysfunction and they have yet to win a playoff game since he left. In the meantime, Saban’s Tide have rolled to three national titles. If you’re keeping score at home, Saban uses the Alabama booster money to recruit as he churns out NFL first-round draft picks routinely, refuses to age, refuses to smile and left LSU to explore a professional job, only to leave for LSU’s rival and lie about it during the process. Why else do we hate Nick Saban? The constant flexing of his leverage to increase his paycheck while denying the entire process. Seemingly every time a big NFL or college football job opens, Nick Saban is connected to it. Saban then makes an aggravated announcement that his current job is his last job and then he gets another raise. Like clockwork. Saban has currently leveraged the people of Tuscaloosa (with help from a fantastic agent and those in Austin) to the tune of roughly $7 million per year. We’ve pointed out the reasons why most of America hates Nick Saban. Now it’s time to defend him. I’m not certain that Saban made a deal with some sort of “Prince of Darkness” but i’m not sure he didn’t either. As for Saban leaving LSU, coaches are some of the most competitive people in the world. Saban reached the apex of his current job and the ultimate challenge, professional football (where Saban coached as an assistant) presented itself. On paper the Miami job was an excellent opportunity and Saban took a big swing. If the team physicians deemed Drew Brees’ health to be satisfactory, who knows what would’ve happened? Maybe Saban wouldn’t have left and Dolphins fans would stop talking about 1972? At least many of the good people of Louisiana that Saban spurned were able to experience a Super Bowl title due in part to the faulty Dolphins medical report. Regarding Saban lying about leaving the Dolphins, he was put on the spot and he made a mistake by coming up with an answer which he thought would take some of the distractions away from him and his team. I’m not saying Saban blatantly lying is heroic or him “falling on any swords,” but it was probably the right thing to do at the time. 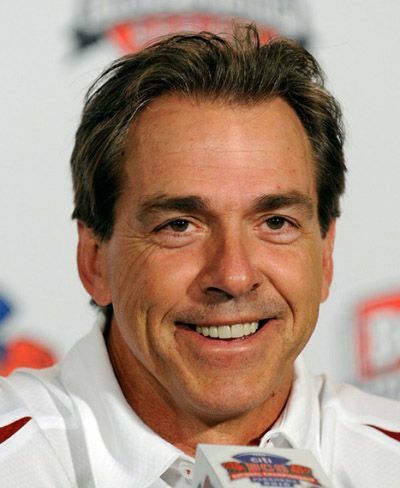 Taking the Alabama job simply presented Saban with the best opportunity of his coaching career. He was in a familiar environment recruiting in the Southeastern Conference and he was rewarded handsomely. Alabama is a Top 3 or 4 job and those type of jobs don’t become available every day or every year. Ask yourself this question, have you or would you ever leave a perfectly good job for an opportunity you deemed better for an increase in compensation? Have you ever interviewed for another job without telling your current employer? I believe most of us have. The only real difference is that many of us don’t necessarily have the media tracking our movements and asking us questions about it for the world to see. With Saban’s flirting for other jobs to get more money, he says all the right things and he says that he’s staying. It’s not his fault he’s a sought after commodity and he has an excellent agent who does his job extremely well. It’s also not Saban’s fault that Alabama is more than willing to open up the checkbook every time his name is linked to a job opening. We’ve gone over the numerous reasons why America hates Nick Saban and why Nick does what he does. As far as his demeanor, that can’t be defended. Ultra successful people are wired a different way, but lighten up Nick, you have an amazing life and you’re great at what you do. Charlie is a national columnist for CampusSports.net. He has covered the NFL, NCAA Football and Basketball for numerous outlets including Fox Sports and has been published in Sports Illustrated and MSN. He has hosted a Drive-Time radio show on ESPN and NBC. He was been featured on the NFL Network and Sirius/XM NFL Radio. In his spare time he eats barbeque, is an unselfish lover and is amused by people-watching.